The Firmicutes are a phylum of bacteria, most of which have the Gram-positive type of cell walls. 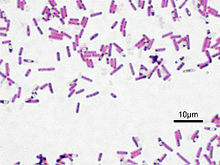 The group is typically divided into the Clostridia, which are anaerobic, the Bacilli, which are aerobic, and the Mollicutes, a class of bacteria which do not have cell walls. On phylogenetic trees, the first two groups show up as paraphyletic or polyphyletic, as do their main genera, Clostridium and Bacillus. ↑ Wolf M. et al (2004). "Phylogeny of Firmicutes with special reference to Mycoplasma (Mollicutes) as inferred from phosphoglycerate kinase amino acid sequence data". Int. J. Syst. Evol. Microbiol. 54 (Pt 3): 871–5. doi:10.1099/ijs.0.02868-0. PMID 15143038. http://ijs.sgmjournals.org/cgi/pmidlookup?view=long&pmid=15143038. ↑ Ley R.E; Peterson D.A. & Gordon J.I. (2006). "Ecological and evolutionary forces shaping microbial diversity in the human intestine". Cell 124 (4): 837–48. doi:10.1016/j.cell.2006.02.017. PMID 16497592. ↑ Henig, Robin Marantz (2006-08-13). "Fat Factors". New York Times Magazine. Retrieved 2008-09-28. ↑ Ley R.E. et al (2005). "Obesity alters gut microbial ecology". Proc. Natl. Acad. Sci. U.S.A. 102 (31): 11070–5. doi:10.1073/pnas.0504978102. PMC 1176910. PMID 16033867. http://www.pnas.org/cgi/pmidlookup?view=long&pmid=16033867. Retrieved 2008-09-28. This page was last changed on 31 August 2017, at 01:38.